Although often referred to as "Barnacle Boy" by colleagues and students because of my research on barnacles, I am generally interested in the ecology and biology of marine invertebrates and I have several ongiong research projects which are lsited below. 1. Population Genetics of a Caribbean Sea Cucumber. My students and I wish to identify the degree of connectivity among populations of Holothuria mexicana along the Mesoamerican Barrier Reef and the greater Caribbean Sea. Populations of several species of sea cucumber in this region have been drastically reduced due to overharvesting for the "Beche-de-mer" fishery. Sea cucumbers are considered the earthworms of reef systems, playing a vital role in nutrient recycyling through their deposit feeding activity and also alkalinizing sea water. We hope that our research will supply useful information for fisheries managers as they work to regulate the industry and protect these important organisms. 2. Defensive Plasticity. The barnacle Chthamalus fissus exhibits 3 morphs. We have determined that the predatory snail, Mexacanthina lugubris lugubris, induces juvenile barnacles to develop either a narrow or bent morphology, both of which defend the barnacle from predation by this snail which uses a labral spine to penetrate the barnacle operculum. We are currently investigating the extent to which this defensive plasicity may impact the northern limit of this barnacle species and competition with a close relative, Chthamalus dalli. 3. Cryptic Skeleton Shrimp Species in Long Island Sound. In 2014 we began exploring the diversity of skeleton shrimp (fouling organisms) at Outer Island off the coast of Stony Creek, CT with support from the Outer Island Foundation. Specimens of Caprella penantis have been positively identified through analysis of morphological characteristics and analysis of DNA sequences. 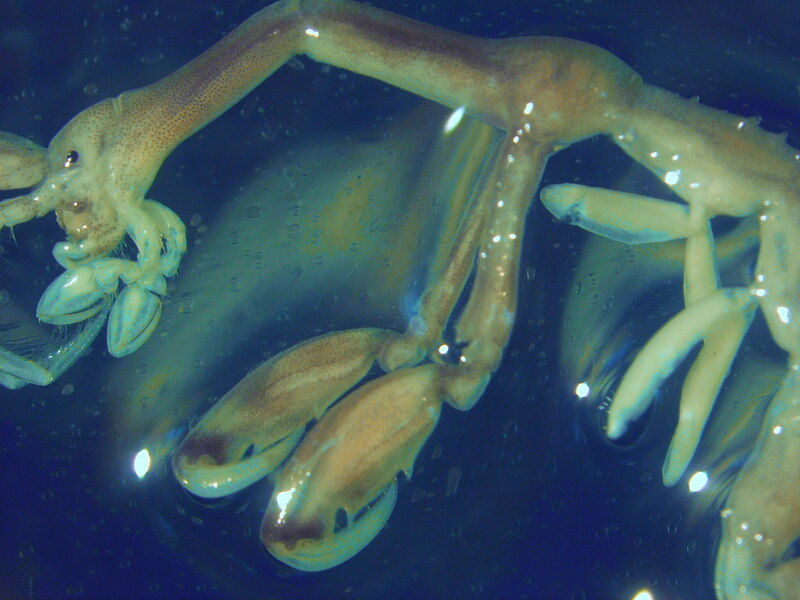 Other skeleton shrimp specimens were tentatively identified as Caprella equilibra based on morphology but results of analysis of DNA sequences suggests this second "type" may not be C. equilibra. In the summer 2016 we began sampling throughout the New Englannd coastline to determine species identities and ranges. 3. Larval Stress and Post-metamorphic Success. I am generally interested in the impact of larval experiences on metamorphosis and post-metamorphic success n marine invertebrates. Past studies have examined seasonal variation in larval physioogical quality and cue specificity in the barnacle Semibalanus balanoides in the field and the impact of salinity stress and low food conditions on larval and juvenile performance of the snail Crepidula fornicata in the lab. 4. NO-HYPE (Nearshore/Offshore Hydrodynamics and Population Ecology), a project funded by NSF involving scientists from CCSU, Woods Hole Oceanographic Institute, Scripps Institute of Oceanography, University of North Carolina, and CICESE (Mexico). We examined the influence of coastal oceanographic features and the reproductive biology of intertidal barnacles on larval production, recruitment, and population abundance for populations at two study sites that differ in overall abundance of intertidal barnacles.